The privacy focused search engine Startpage will launch new image search related tools soon that improve the user experience significantly. Startpage, just like Google, Bing and DuckDuckGo, offers a dedicated image search option that users can make use of. While you can use web searches to find sites with images as well, using the image search engine returns image results right away. That's great for previewing images, something that web search does not really offer. Up until now, you had only a couple of options when it came to finding images using Startpage. Image searches start like they always have. Open Startpage and click on the images link there to get started. 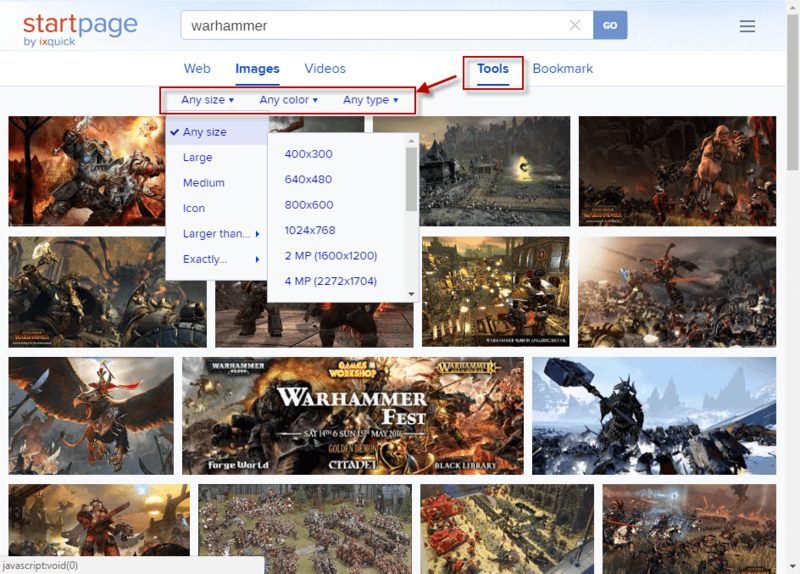 Or, type in the search term and run a search, and pick the images filter on the results page. Note that it is language encoded. You get the right URL when you right-click on images on Startpage and select copy link address from the menu. Size: This enables you to filter image results by size. You can either pick one of the defined sizes, enter a desired minimum size, find icons, or find custom size images by entering width and height manually. Color: Select the desired color, and Startpage will only return images if the dominant color matches the selected one. Type: Enables you to filter images by file type. Supported are jpg, png and gif. The new tools improve the user experience when searching for images on Startpage. Take the search for new wallpaper images for instance. While you could do so previously as well, the new tools enable you to set a minimum resolution, and also color or file type if you want. So, no more clicking on images to find out if they match the desired resolution for instance. Since you may not want wallpaper images that are lower than the resolution of your device, you can use the image search tools to make sure that all low resolution images are filtered out automatically. Want only super high resolution images? Either pick a custom resolution, or filter all image results that are smaller than 70 Megapixels (that is 9600x7200). Want only red wallpaper images to match the color scheme you set on your operating system, or your favorite color? Done with a simple click on the color filter. Google Images and Bing Images offer similar, or even more image search tools. On Google, you can filter by usage rights or time of publication. On Bing, you can filter by layout and people on top of that. But Startpage brings privacy to the table, something that you won't get when you run searches on Google's or Bing's image search engine. You get the same privacy protection that you get when you run searches on Startpage. Startpage's image search capabilities surpass those of DuckDuckGo, another popular privacy focused search engine. If you check out DuckDuckGo's capabilities right now, you will notice that you can only filter by small, medium or large images. There is no option to set a minimum resolution, nor options to filter by color or type. The new search capabilities will be rolled out very soon to the public. Still no reverse image search. Startpage is much better than DuckDuckGo for me, it values privacy differently and without all the shady things DDG did in the past. Nice addition, the filter are very useful when looking for images. What shady things did DuckDuckGo do in the past ? I don’t know if it’s shady but… DuckDuckGo, Google and some other search engines send the referer (intentional misspelling) header to whatever website you go to. When going from HTTPS to HTTPS (or to HTTP) the referer is Not supposed to be sent. StartPage does Not send the referer. Google, DuckDuckGo and others apparently make their own rules! If you do a search for “what is my secure referer” and then pick the link for rustybrick you can see the referer, if any. With FF and Pale Moon I have an about:config entry modified so that the refer is not sent when leaving a website, only if hosts match. Which is why I don’t worry about it when not using StartPage. Chromium browsers probably have an extension that will do the same thing. > When going from HTTPS to HTTPS (or to HTTP) the referer is Not supposed to be sent. Really ? Why does network.http.sendSecureXSiteReferrer defaults to true then ? That’s a very good question, but first… I was remembering wrong. The protocol is that a HTTPS site Can send the referer to another HTTPS site but is Not supposed to send it to a HTTP site. Had to go through some old bookmarks to refresh/correct my memory. I just have it in my head that the referer should not ever be sent when leaving a site using HTTPS. To me it just seems wrong. I apologize for my mistake! That said, StartPage never sends the referer but Google, Yahoo, Bing and DuckDuckGo will always send the referer. I don’t see ‘sendSecureXSiteReferrer’ in FF ESR v52. When did that get removed? I tried adding it to FF to see if it still worked and it does not, at least on my system. Setting ‘sendSecureXSiteReferrer’ in Pale Moon to false prevents DuckDuckGo and Bing from sending the referer but… Google and Yahoo do Not honor that preference and they still send the referer. That’s rude! network.http.referer.XOriginPolicy = 2 (Default: 0). Using #1 breaks a couple websites on my end and prevents me from logging into my TP-Link router. As far as I can tell both 1 and 2 prevent the referer from being sent to a different website. Most chromium browsers have a flag to trim the referer, “Reduce default ‘referer’ header granularity” that can be enabled. To block the referer you can add a command line switch ( –no-referrers) to the target in the shortcut but that can and probably will break some websites, it does for me. Does this new image feature also apply to the ixquick.eu metasearch engine? Great to see startpage.com putting in new features. I have absolutely nothing against DuckDuckGo, but startpage.com, and ixquick.eu, just feel more “private” to me somehow. If only now the startpage.com / ixquick.eu developers would put in some new eye-pleasing themes, like DuckDuckGo’s, rather than the blue tone of Google, that would be really great! Is DuckDuckGo safer and more private to use if you use thed URL parameters instead of letting them place a cookie on your PC? Also, does Startpage.com exclude users from any “filter bubble” from Google, or are they sadly included in the searches? I just want to know Martin: considering all the privacy items being put out by DuckDuckGo recently on it’s Twitter account, have you changed your mind about DuckDuckGo and would you use them more? They seem to be getting more and more privacy conscious. Don’t forget the main thing is not to, in effect, hide from the likes of the NSA or other agencies, but to hide from filter bubbles and targeted advertising, like those on Google and other search engines. In this respect both StartPage.com and DuckDuckGo do a fantastic job. Despite the fact they (startpage.com) advertise a lot that Edward Snowden says to use startpage.com, he DID say also in the video on Youtube that “Other services are available” and he also said in the video that, not only the USA, but “Germany, the UK and the Netherlands are increasing their surveillance powers.” The Netherlands, don’t forget, is where startpage.com is located. Also, using a VPN and, say, NoScript on Firefox, does exactly the same job as the proxy on startpage.com (changes your IP address and stops scripts from running on the selected web page). Startpage.com is a great search engine, but please keep in mind that it will not hide you from everything or everyone. I forget why I stopped using Startpage some time ago, but I am back to using it again in its current incarnation. Very impressive function.